Little Colton was not quite 4 years old when his appendix ruptured. He was an extremely sick little boy and the surgeon was not expecting a positive outcome, but Colton’s family experienced a miracle when he survived the surgery. What Colton experienced during the surgery was extraordinary. Over several months following the surgery, his family was to receive bits and pieces of what Colton had experienced. He began telling them about being in Heaven and meeting people whose faces and names he could recollect clearly. Many of the details he shared matched Biblical scripture exactly, even though he had not learned it in Sunday School nor could he read. 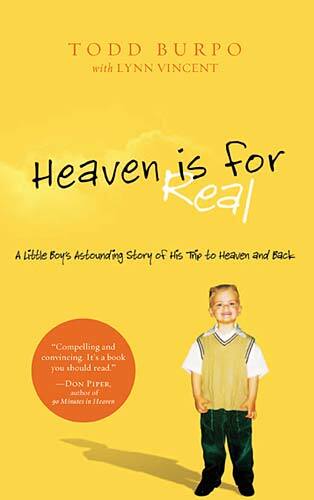 Heaven is for Real is Colton’s story as told through the eyes of his father. With childlike innocence and directness, Colton describes Jesus and his great grandfather and tells of meeting them and how the angels sang to him. This is a wonderful story about a little boy’s trip to heaven and back and his conviction to what he experienced. It is an extremely fast read which I could not put down. I have read it twice and am certain I will read it again several more times. The book gives meaning to the phrase “the faith of a child” and has given me insight into the hope of that faith. This is one of the most inspirational books I have ever read! A most remarkable and stunning story! It was thought-provoking with lots of opportunities for inner reflection and it closes with hope and determination. This is a great book about a great God using different people to accomplish His work. It’s full of love, friendship, faith, and family. I could not put it down. 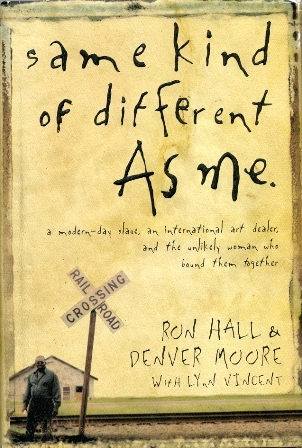 I would recommend this book to everyone! Lola, Rae, and Bug by St. Charles Community College’s own Edie Conrad is a whimsical book of children’s verse. Conrad’s creative wordplay allows the reader to romp with Conrad’s grandchildren (Lola, Rae, and Bug) and her dog (Bennington) in a world of wonder and imagination. The illustrated book covers everything from nature to food to relationships. Tug of war, cooking, and reading are all described through a child’s eye. My particular favorite is the poem entitled “Stolen Sunshine.” “Stolen Sunshine” questions why the sun is there one minute and gone the next. I’ll start again. . . page one. David McCullough’s 1776 provides readers with interesting facts about the year that our country declared its independence from Great Britain. The book revolves around our newly found country trying to establish its government and military, with the focus being on the battles that the Continental Army fought against the British. Interesting tidbits include that most of the Continental Army were not disciplined and were not aware of how to engage in battle, not to mention that they were not very hygienic. Overall, the book is an interesting read for those who are fascinated by early United States history or, for that matter, history in general. It seemed the parts about specific persons (i.e., George Washington and Nathaniel Greene) moved more quickly than the areas about battle plans and strategy. If someone is looking for a quick read, this would not be the book. However, if someone is interested in learning facts about the year 1776 that they didn’t learn in school, this would be the one to get. Fiction · In the Library · Julia P · Quick Read! The 158-Pound Marriage revolves around a co-mingling of couples – a unique foursome that comes together in a small, New England, university town. As one might imagine in a situation that involves casually swapping spouses, there’s a lot of room for things like jealousy, confusion and hurt feelings. The book takes you through the lives of each of these characters, both as individuals and as couples, and shows you just how intense and consequential relationships can be. Fortier’s novel takes the classic story of Romeo and Juliet and gives it a twist – making the case that these two start-crossed lovers were, in fact, based on real people. Julie Jacobs, the novel’s protagonist, has traveled to Italy after the death of her Aunt Rose. She goes off in hopes of learning more about her parents (who died when she was a young child) and hopefully stumbling across a hinted at inheritance (her twin sister, Janice, seemed to have been the only one that Aunt Rose felt deserved to be the beneficiary of her estate). Setting off on this journey, Julie discovers that her real name is actually Giulietta Tolomei and that she is descended from a woman of the same name – the “original” Juliet. With this discovery, along with many others related to the Romeo and Giulietta that lived in Italy in 1340, the reader is transported between the past and the present with considerable overlap. The newly-christened Giulietta soon finds herself entangled in a mystery that seems to get more confusing and dangerous the deeper she goes. 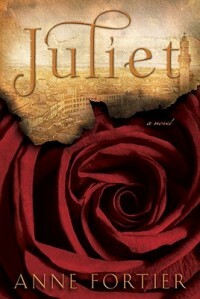 I definitely thought this was an interesting take on the Romeo & Juliet story. There’s an underlying romantic element that emerges later on which readers of romance will certainly appreciate. It was an entertaining audiobook to listen to and I’m glad I came across it scanning the shelves at my local library. I’m a definite fan of graphic novels and found Fun Home to be an interesting book. It’s a nice change of pace to have something visually stimulating while you read. The book got a lot of acclaim, rated a best book of the year by publications like Time, The New York Times, Publisher’s Weekly and the St. Louis Post Dispatch while also being a National Book Critics Circle Award finalist. Fun Home deals with a number of issues, all revolving around the relationship Alison (the author) has with her father. Suffice it to say, there’s a reason this graphic memoir uses the term “tragicomic” in the subtitle. Fun Home could be viewed as a coming out story, for both Alison and her father. The author had always noticed there was a distance between her father and the rest of her family, it was only shortly before his untimely death (which also raises a number of questions) that Alison learned that her father had been a gay man living a straight life. Fun Home seems to be Alison’s attempt at getting a better grasp of who her father was, offering a marked contrast between the life he felt he was forced to lead and the freedom she had to explore and openly claim her sexuality while in college. Point to this when people argue graphic novels are “just comics.” The depth and emotion they can express, as can be seen in Fun Home, speaks to that.